The philosopher Ludwig Wittgenstein employed musical analogies to illustrate his ideas. (What deep thinker can resist seeing notation as an entity distinct from the music it represents?) A copious scribbler, Wittgenstein ruminated on favorite and despised composers, particularly disdaining the music of his time. In the philospher’s view, it was as if nothing of value had been composed after the 19th century’s demise. Commenting upon Wittgenstein’s indifference, observers have wondered why the famously arrogant thinker who attempted to infuse philosophy with logic didn’t find Schoenberg’s 12-tone system attractive. Orderly serialism does seem an obvious complement to Wittgenstein’s philosophy. Pitches lack tonal music’s grammatical meaning, having no intrinsic value except in relation to one another. Pitch manipulation is rules-based rather than expressive. But by examining his few artistic endeavors, it becomes clear that Wittgenstein could only have been attracted to common-practice tonality, with its codified rules and delineation between ornament and form. Wittgenstein hailed from a musical family. His grandparents were wealthy industrialists, the Austrian Carnegies of their time. (The philosopher momentarily became Austria’s richest man when his father died.) Ludwig’s grandmother was violinist Joseph Joachim’s distant cousin; in fact, Joachim became an adopted son. The elder Wittgensteins came to know Joachim’s accompanist, Johannes Brahms, who gave piano lessons to some of the philospher’s aunts. Clara Schumann, Gustav Mahler, Richard Strauss, and Bruno Walter attended Wittgenstein soirées, as did critics Eduard Hanslick and Max Kalbeck. By the century’s close, Brahms had become a fixture at the Alleegasse Palais, where his clarinet sonatas and quintet had their first private performances. Born in 1889, young Ludwig matured at Vienna’s musical epicenter. Two older brothers were destined for careers as keyboard virtuosi before pressures drove them to suicide. The remaining brother — never considered the family’s best pianist — achieved great success even after losing an arm in WWI. Particularly interested in new music, left-handed pianist Paul Wittgenstein commissioned concertos and chamber music from Hindemith, Korngold, Prokofiev, Ravel and Strauss. Oblivious to his brother’s achievements, the philosopher liked to say that there were six truly great composers: Haydn, Mozart, Beethoven, Schubert, Brahms and Labor. Labor? Blind organist and composer Josef Labor (1842-1924) owed much to Wittgenstein patronage. Paul commissioned his first left-handed concerto from Labor. Schoenberg counted among his students. Ludwig was a close friend, and when visiting Vienna, he would pass significant time, even days, with the aged composer instead of with his family. As an adult, Wittgenstein learned to play the clarinet as part of his teacher-training. He gained enough proficiency to play Brahms’ sonatas and of course Labor’s. Anecdotes relate his untiring obsession with perfect recreations of the classics. He apparently felt little of that spontaneous joy that comes of joining with others to play chamber music, disdaining all but his “great six.” His musicmaking conformed strictly to the printed page, striving for the unattainable Ideal. He was a fastidious listener. Hearing a Schubert record playing at the wrong pitch, Wittgenstein would interrupt the conversation to adjust the turntable’s speed. Acquaintances marveled at his virtuoso whistling. His repertoire included Brahms’ Haydn Variations and other symphonic works. He would unhesitatingly correct others’ inaccurate humming or singing. Besides these few bars, Wittgenstein’s artistic creations include a sculpted woman’s head. (He also designed airplane propellers!) His most significant creation is the sculpture’s container, the house he designed for his sister Margaret, immortalized in Gustav Klimt’s portrait. There are instructive parallels between Wittgenstein’s approach to architecture and music. As with music, Wittgenstein showed little interest in contemporary architecture despite acquaintanceships with Vienna’s leading lights. His father had single-handedly bankrolled the Viennese Secession, and Ludwig knew Adolf Loos. At first glance, the house reflects the prevailing unornamented style: flat façades, crisp lines, absent trimmings and festoonery. However, Wittgenstein’s obsessive attention to detail indicates a dominant vision stemming from rigid principles. He thought deeply about how the house was to be used and experienced. The residence features precisely designed window latches, one-of-a-kind door handles, custom-built radiators (specified in such a way that no Austrian firm could cast them), and ingenious, asymmetrical floor-tile patterns. Similarly in music, Wittgenstein would only have found a use for a system the details of which enhance an underlying structure. Common-practice tonality is such a system. Precisely specified details find their complement in the rules that manage first and second theme groups, specifying a return to the initial key. Ornamentation is secondary to proper and effective use of harmony. Rarely do Haydn, Mozart, Beethoven, Schubert or Brahms lose their tonal argument. Presumably, Labor kept to that tradition. Mahler and the expressionist Schoenberg (limiting ourselves to Vienna) were among the first to thwart common-practice harmony and tease its forms. Starting in the minor mode and finishing in the major, as in Beethoven’s Ninth, isn’t a concern. Wittgenstein would have shunned the transformation of tonality and structure of Mahler’s Second, Schoenberg’s Pelleas und Melisande or Verklärte Nacht, works that migrate from initial tonal areas and play havoc with sonata form. Needless to say, he thought little of Wagner and his brother Paul’s four-hand partner, Richard Strauss. With its rules and fixed forms, tonality perfectly suited the philosopher’s requirements. 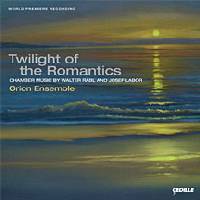 “Twilight of the Romantics.” Walter RABL: Quartet in E flat major for clarinet, violin, cello and piano, Op. 1 (1896). Josef LABOR: Quintet in D major for clarinet, violin, viola, cello and piano, Op. 11 (1900). Orion Ensemble: Kathyrne Pirtle (clar), Florentina Ramniceanu (vln), Jennifer Marlas (vla), Judy Stone (vlc), Diana Schmück (pno). Cedille Records CDR 90000 088 (http://www.cedillerecords.org/). Released in 2006, this Cedille release contains a piece which Wittgenstein presumably played himself, Labor’s Clarinet Quintet. Like Brahms, Labor makes much of contrasting duple and triple, however with a flexible manner and lighter hand. The four-movement work proceeds according to Classical plan, though the brief slow movement marked Quasi Fantasia: Adagio, which offers heightened drama recalling stormy Beethoven, introduces the following theme and variations. A welcome project would group Labor’s quintet with similar works by Brahms and Robert Fuchs. Walter Rabl’s quartet isn’t more adventurous than his more familiar peers, though there are figurations in the Adagio molto suggesting Fauré’s quartets and quintets with piano. “Organ Works of Josef Labor.” Josef LABOR: Sonata, Op. 15 (1912); selections from Seventeen Preludes (1908); Improvisations, Op. 13; Fantasia, Op. 9 (1908); Three Interludes (1914); Fantasia for Organ Duet, Op. 12 (1912?). 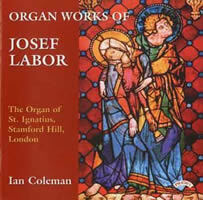 Ian Coleman, Ann Carey (The Organ of St. Ignatius, Stamford Hill, London). Priory PRCD 688 (http://www.priory.org.uk/). This Priory collection demonstrates Labor effectively combining melody and harmony in short forms. These airy works, sounding like Brahms’ late choral pieces, afford the organist ample opportunities for color, one of this recording’s more pleasurable aspects. The preludes and interludes are light and brief, emotional subtlety taking precedence over pompous virtuosity. The Sonata and Fantasia, Op. 9, are multi-movement essays, the latter an eight-part theme and variations on the Austrian national anthem. Given the Haydn-attributed theme’s overuse during the past century, it’s hard not to wince at the initial statement and during the fugue’s most grandiose sections. With its efficient themes and counterpoint, the Sonata’s three movements nicely cohere, the closing Chaconne reflecting Bach studies. 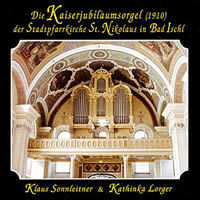 “Die Kaiserjubiläumsorgel (1910) der Stadtpfarrkirche St. Nikolaus in Bad Ischl.” Adolph Friedrich HESSE: Fantasie für Orgel zu vier Händen, Op. 87. Johannes BRAHMS: four preludes from Elf Choralvorspielen, Op. 122 (1896). Anton BRUCKNER: Festmusik (ca. 1890, arr. Erwin Horn). Josef LABOR: Orgel-Fantasie für zwei Spieler, Op. 12 (1912? ); Sonate h-Moll, Op. 15 (1912); Fantasie über die Volkshymne von Haydn, Op. 9 (1908). Klaus Sonnleitner, Kathinka Lorger (The Kaiserjubiläumsorgel, Bad Ischl, Austria). Edition Lade EL CD 022 (http://www.edition-lade.com/). This organ recital offers Labor’s Opp. 9, 12 and 15 alongside works by Brahms, Hesse and Bruckner. I’m not surprised that Hesse (1809-1863) is an unfamiliar name. The virtuosic Fantasie is a blustery, thankfully brief, multi-part affair. Brahms wrote his chorale preludes as a memorial to Clara Schumann. The four selected here are delicate teasers featuring welcome illustrations of this instrument’s registrations. The Bruckner, a grand romp, was pieced together by Erwin Horn from sketches and other Bruckner works. A subset of Labor’s entire organ output, these three pieces demonstrate the composer’s pedagogical bent and breadth. Given that its material became the Austrian national anthem, Haydn’s Variations sound a little corny. The B-minor Sonata, a bit more serious in scope than the two-player Fantasie, demands the most attention. Whether intended or not, this recital leaves one with the impression that late-Romantic German organ music was predominantly secular. 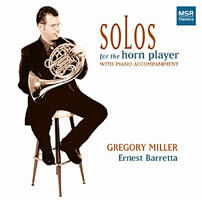 “Solos for the Horn Player with Piano Accompaniment.” Asst. comps. incl. Josef LABOR: Theme and Variations, Op. 10 (1899?). Gregory Miller (hn), Ernest Barretta (pno). MSR Classics MS 1147 (http://www.msrcd.com/). Mason Jones’ pedagogical collection for horn and piano includes arrangements as well as works specifically scored for that combination (Glazunov’s Reveries, Op. 24, Dukas’ Villanelle, etc.). Several are concert or chamber works in which the accompanying parts have been arranged for piano (Rondo from Mozart’s E-flat Horn Quintet, K. 407, Scherzo from Beethoven’s Septett, Op. 20, Saint-Saëns’ Romance, Op. 36, Ravel’s Pavane, etc.). In its horn and piano arrangement, the Andante from Mendelssohn’s “Reformation” Symphony comes across as a tad funereal. Apparently this is the first recording of Jones’ 1962 publication in its entirety. The most vigorous pieces, Dukas’ Villanelle and Brahms’ Scherzo, from the Serenade, Op. 11, are particularly exciting. The longest entry here, Labor’s Op. 10 Theme and Variations, asks for cello or horn. After the soloist’s extended introduction, the pianist keeps busy. Having heard this sober and slightly archaic work on horn, I can’t imagine it providing much satisfaction in a cello version. Despite Miller’s lyric playing and Barretta’s even support, my attention wandered. The brief notes inform us that Labor was a friend to Paul Wiggenstein [sic! ].